Brand New Images of Inca City! For the past while we’ve been focusing on Inca City, and now we have even more images for you to explore. As our way of saying thanks for the hard work and time you put into Planet Four over the past two years, we’ve uploaded the 6 HiRISE images (find out more in here and here) that were publicly released by our friends on the HiRISE team based on your vote back in August. The cutouts shown on Planet Four are HiRISE images are nearly as close to right off the Mars Reconnaissance Orbiter as we can get. These observations span from this past August,when the sun began to rise about the horizon ( the start of the Season 5 monitoring campaign), to as recent as November of last year. The images will add to our understanding of the South Pole and its seasonal processes. We have already Season1-3 of Inca City classified thanks to your help. The science team is working now on analyzing those results. We have Season 4 and now 5 of Inca City soon to come with your clicks. 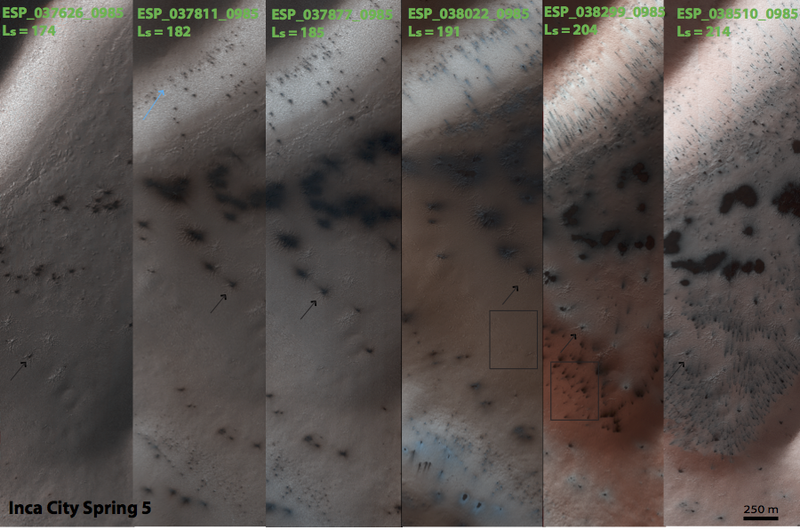 These new images will expand the baseline we have on the behavior of the geysers,fans, and blotches to 5 Martian years. If you have a moment or two to spare, please help by mapping fans and blotches today at http://www.planetfour.org.